Andrew Jose has gained an outstanding reputation with over 20 years in the hairdressing world. 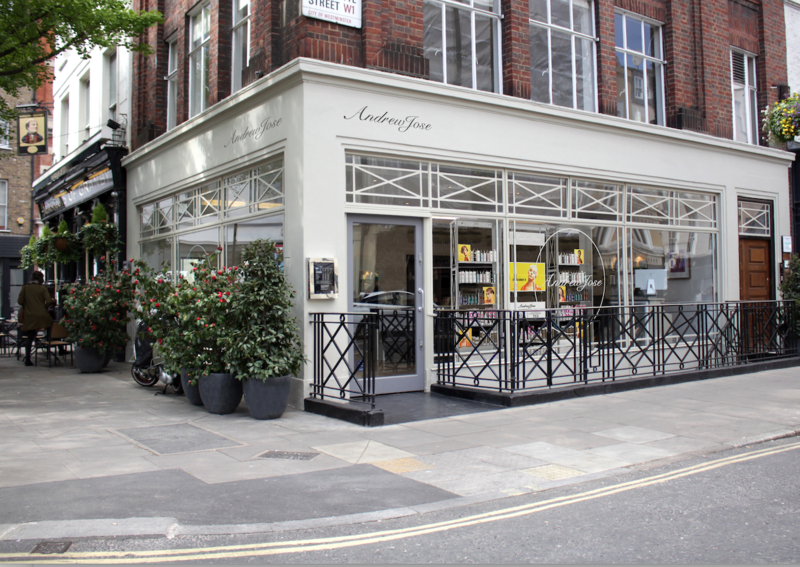 His friendly, bright and buzzy salon is located in Charlotte Street, at the heart of London's West End. You'll find Andrew and his team of skilled stylists. at No.1 Charlotte Street, in London’s vibrant West End, two floors of hairdressing and hairdressers. We also have young stylists starting out who we have trained... they're all great but we always like to find the expert who's just perfect for you. In our opinion a great salon is open to all. We have specialists in cutting, colouring, Afro Caribbean, men, safe natural hair extensions and we're famous for blow dry's that last from night to morning. We asked our clients why they came to us; number one was that their cut lasted longer. I was recommended to this lovely salon by a good friend who’s hair always looks good. And never regretted it . The team are professionals . They really care . I’ve never regretted it and changed permanently from Richard Ward to Glen at Andrew Jose after just one ( fabulous) cut . It’s great too stepping out of the salon onto beautiful Charlotte Street with its choice of charming restaurants galleries and shops . Can’t recommend this place highly enough. Glad with what I got. Being a student would have appreciated little less price for the haircut. However it was a wonderful experience! I do recommend the parlour to people .. Most beautiful place I’ve ever seen. Nice atmosphere, felt very looked after, professional staff, just everything perfect! My hair looks amazing.Highly recommend! My second visit to this salon and again I’ve been very pleased with my hair. The stylist listened to my concerns and delivered exactly the style I asked for. I have my hair cut here with Jess and she is really talented and friendly. I trusted her to cut all my hair off! And she always does a great job, and is very efficient, listens to what you say and makes you feel comfortable and confident. The stylists at Andrew Jose are not only so very skilled, but incredibly warm, personable and friendly. I felt right at ease hosting 5 clients - they did all the work for me and each client left the salon incredibly satisfied with their treatments. Will definitely return! Natasha is my hairdresser, she has a real warm and welcoming presence and i fountain of knowledge in all things hair! She takes problematic hair like mine and does wonders. Real dedication to her craft. Great relaxed vibe in the salon. And great service all round! And big thumbs up for Natasha ???? I love getting my hair done at Andrew Jose! Like most women, I'm very protective of my hair and can feel quite nervous when trying something new. But I always trust Andrew and I love that he and his team challenge me to try something different. I never regret it. Moreover, I always feel great while getting my hair done and afterwards because the salon such a lovely place! She’s AMAZING!!! I cant thank her enough for the beautiful perfect balayage and service. Andrew is a great guy with lovely staff. Ann F is the best. Been my hairdresser for 24 years! I got a message to say that as it was my birthday I could get a free blowdry, which I did. The woman was amazing and I can honestly say its the best blowdry I’ve ever had. Really made my day! Highly recommend. The color was terrific. I used a gloss without ammonia. A great hairdressers. Anne always does a lovely cut. The salon is classy but relaxed. I go regularly for men’s haircut with Lucas and am very satisfied! A true pro in every way. People always comment on my hair and ask where I have it cut. It’s always Andrew Jose!